Sam and Steve doing some crop inspection in the garden. When we are working side by side with our kids, we never know what types of conversations will occur. One conversation with Sam was about weed identification. We looked at pig weed, lambsquarters, different grasses and velvet leaf. What was exciting to me, since I worked in weed science for three years, was that at his age – he did very well identifying weeds. Another conversation was about corn and how corn kernels get on the cob. Learn more about how corn is fertilized and how kernels get on the cob on this blog which describes the dad (tassel), the mom (silk) and the baby corn (corn kernels). This week, we have also had some tough conversations. It wasn’t around the garden but rather regarding our chickens. We lost some chickens this week to predators. Three of the chicks we hatched this spring were grabbed out of their pen, and then on another night one of our roosters was killed. We think the predator is a very smart, big raccoon. How it survived one of Minnesota’s coldest winters ever, is a mystery. It has been a few hard mornings, awakening to these unpleasant and frustrating situations that we found during morning chores – finding dead chickens. But I know it is important for our kids to experience the cycle of life, to see Mother Nature at work and to understand that while animal care is our top priority – sometimes God has another plan in place. The good news – the rooster has some offspring, and a couple of the chicks appear to be roosters. So the boys are excited that the rooster’s genes will live on. How do we handle these conversations? We take time to understand their questions, encourage their inquisitive nature and understand their emotions during these challenges with an end outcome of learning opportunities that will last a lifetime. We have been staking the tomatoes slightly differently then we have in the past. We are excited to see how this works. We hope it will make harvest easier. We replanted some carrots this week. Sam thought we should use his water gun as part of the planting process. Rest assured the area for this experiment was small. 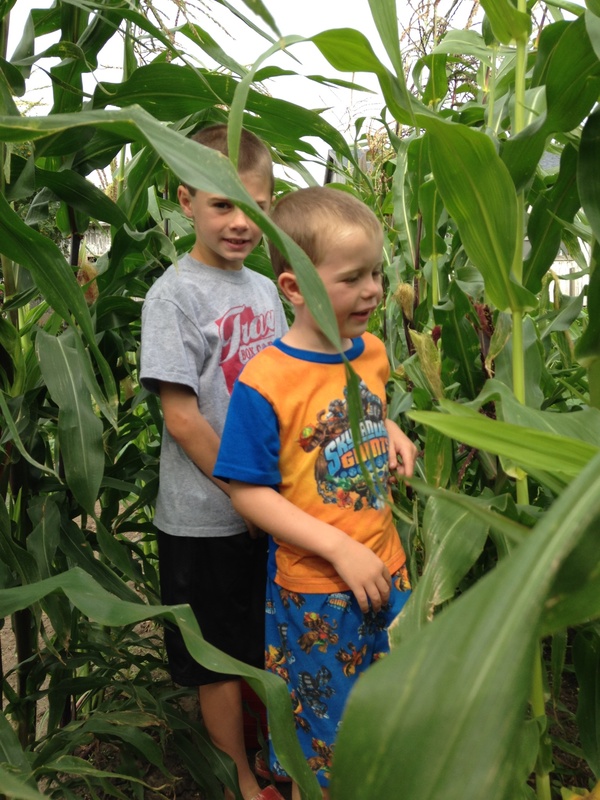 The boys have been inspecting the ornamental corn. It has been tasseling. 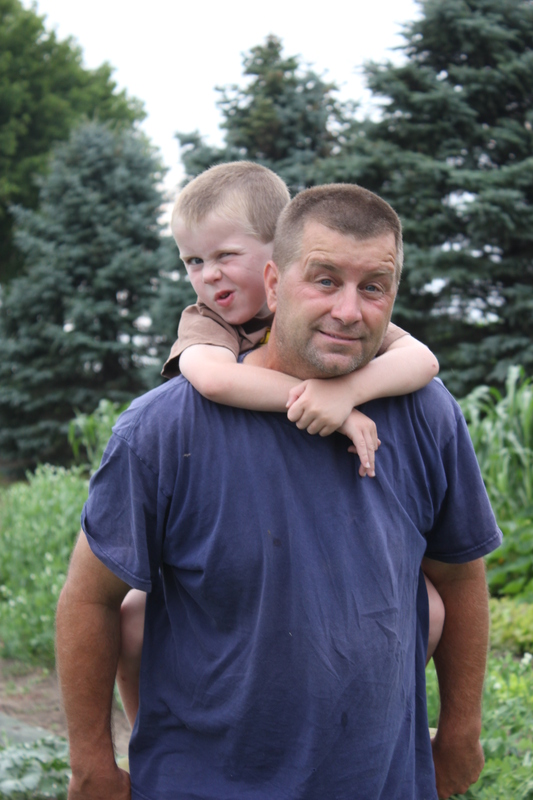 Ask the boys about this process – I am sure you will be surprised at what is growing on in the garden. Prizeleaf Lettuce – A beautiful colored lettuce to add to the salads. Add some fresh strawberries or dried fruit to your salads and Enjoy! Spinach – Remember to wash before eating. A combination of these vegetables will make such a wonderful meal! Sugar Snap Peas – We are in between a crops. Some of them may be quite large – you may want to peal the pod off and just eat the peas inside on the larger ones. Green Beans – They are growing strong ! Try freezing or canning some of your extras or simply eat them raw. Cucumbers – The cucumbers are also growing like crazy. If you would like to can any pickles let us know. We also have dill for you to use as part of your share. Summer Squash/Zucchini – Here is a recipe for you to try. Check out the Zucchini Brownie recipe below. 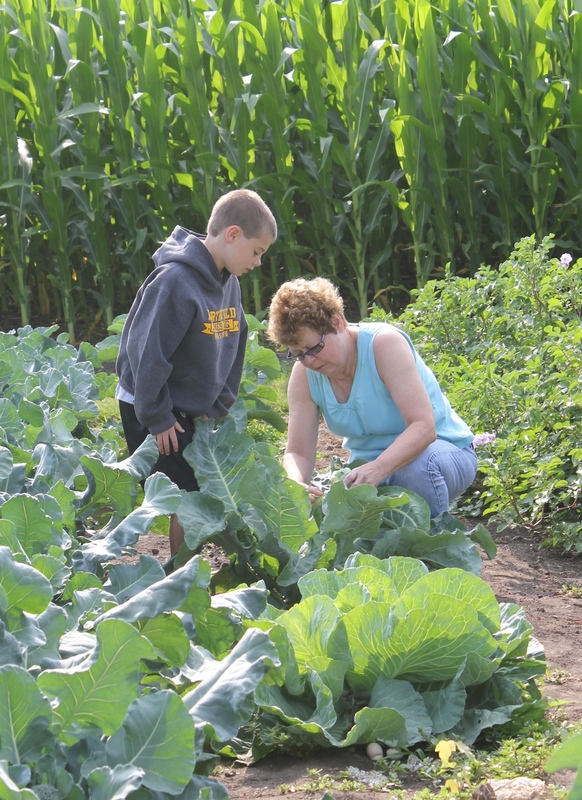 Keith was busy showing Grandma how to harvest cauliflower. Cabbage/Broccoli/Cauliflower/Kohlrabi – These items have all been growing but not at the same rate which is allowing us the opportunity to rotate through to each of you. We hope you have been enjoying this addition in your boxes. Some day Keith will value the opportunity he had to gather a bouquet of flowers for his Grandma’s share in the CSA. Fresh Arrangement – Hosta leaves and a surprise flower lilies, zinnias or hydrangeas. While the zucchini is growing like crazy, it brings a few of our favorite recipes to mind. I couldn’t wait to make this one. It is a favorite in our house. Enjoy! •In a large bowl, combine the flour, cocoa, baking soda and salt. In a small bowl, combine the zucchini, sugar and oil; stir into dry ingredients until blended. Stir in walnuts and vanilla. Pour into a greased 13-in. x 9-in. baking pan. Bake at 350° F. for 35-40 minutes or until a toothpick comes out clean. Cool on a wire rack for 30 minutes. This entry was posted in Uncategorized and tagged buying local, CSA, factory farms, family farms, farming, food, Gardening, gardening with kids, local foods, Northfield, vegetables. Bookmark the permalink.